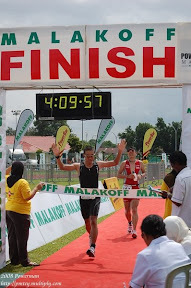 I've just got back from KL last night. Me and Mrs were there for 3 days and 3 nights. 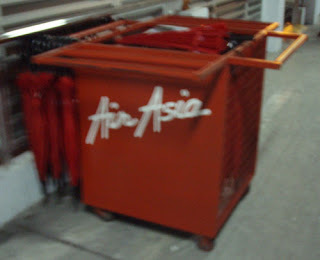 Since AirAsia has a direct flight from Brunei to KL, we decided to try - macam mana rasanya naik penerbangan murah ani. 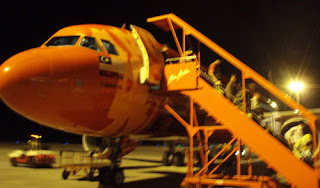 We reach KLIA - LCCT (Kuala Lumpur International Airport - Low Cost Carrier Terminal) around 11:06pm. We have to walk 600 to 800 m to the arrival hall. At first I was thinking of using KLIA Express Train to KL Central since the LCCT is part of the KLIA but there was no signage showing how to get to the KLIA Express Train. So backup plan is either using Taxi or Bus. Since we are already travelling on a cheaper fare, pakai bus saja, alang alang murah. 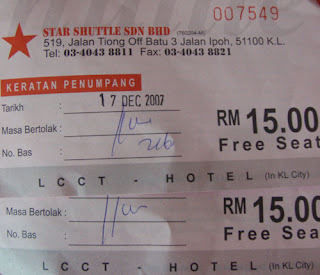 It costs RM15 per person to transport us to our hotel at Bukit Bintang. The bus ride took us more than an hour due to a lot of stopover. When its time for us, the bus driver terlimpas our hotel and he dropped us at Federal Hotel, Bukit Bintang and we have to walk back up the road to Capitol Hotel carrying two medium size bags and it was already 1:00am in the morning. Baik jua nda jauh....dalam 200 meters. Ambil yang murah, dapat lousy services. Kalau ambil taxi, lama udah sampai. To be continued......next morning.